Hi guys. 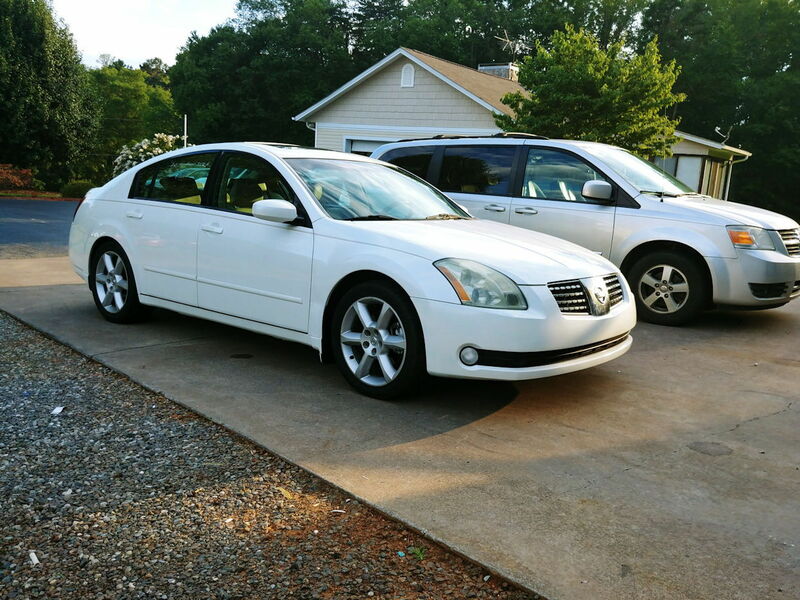 First post here - we've just bought an 05 Maxima SE with 178,000 bought 'As Is' as a second car/runaround. Well there have been a few issues with it, but I need help with the most annoying, please. Within days of buying the car we started hearing an odd, regular noise coming from around the timing belt/pump area. Not long afterwards, the power steering went. Took it to the local mechanic who said it was almost certainly the power steering pump. Had a friend put in an AC Delco re-manufactured pump over the last weekend along with new power steering fluid and all ran fine until this morning (Monday) when we went to start the car up and that same, regular mechanical/electrical type noise is back from the same place. The nose gets faster and raises in pitch when the revs go up and it doesn't matter whether the engine is hot or cold, the noise is still there. I've taken a couple of videos, though it's a little hard to hear the noise over the engine. In real life it's actually louder. In the first video, I've tried to capture the sound itself. The second, from inside the car, was to show what happens when I increase the revs. That's timing chain, not belt. If you are concerned with the noise, you can replace the chain tensioner guildes. Thanks Tarzan. Are you reasonably confident of that given the vids & symptoms? (I have no idea, hence the question). I'm not sure the videos really let you hear incredibly well - it's not a constant noise, but it IS repetitive, kind of like a mechanical/grinding 'heartbeat' along with the engine noise. I've added a new video to the OP that lets it be heard better. Is it an expensive fix and - if that's what it is - is it safe to drive? Last edited by MakkaPakka; 08-22-2018 at 01:55 PM. If your mileage is around 100k on a VQ and you get a coffee grinder noise from the upper oil pan area, that's tensioner guides. Google for youtube videos of Maxima chain tensioner noise and compare with what you hear from your engine. To be honest, I'm reading all over the place that the tensioner guide issue is pretty common with this, but also the sounds I'm hearing on mine really don't sound quite like any I'm hearing on other videos. Maybe it's just me. But... what about the fact that I was getting this exact noise before having the steering pump replaced before it went away then came back again? Wouldn't the tensioner guides have carried on making their noise? Also, mine has that sort of 'pulsing' noise as opposed to being constant. UPDATE (Since I HATE when people post this stuff on forums then find their own fix and leave everyone else guessing). After trying all sorts of different approaches today, I had a brainwave and bought some more power steering fluid. I don't know whether it's the real procedure for bleeding it, but I found an incline and turned the wheel to full lock each way 10 times when the car was idling, waited a few minutes and did it again. Topped the fluid up once more to Max and voila - not a sound! Not only has that 'pulsing' sound gone, there's no sound at all when the wheel turns. I'll need to keep an eye in case there's a leak somewhere now, but hopefully that would be a much cheaper fix than opening up the engine! Thanks again to Tarzan for taking the time to offer suggestions and I'll be back with some other niggles (that aren't anything like as serious) in due course. Last edited by MakkaPakka; 08-23-2018 at 12:20 PM. I am glad it was that simple! If this was a Honda, I'd probably suspected the PS pump o-rings, but with a Maxima engine of this age only chain tensioners are a common problem. Timing belt, chain belt or both?